What a Wonderful Way to Start another Birding Year!!! Read: Harpy and Crested Eagle in Alta Floresta & Nesting Zig-Zag Herons, which gave our clients great views, at day time!!! Our guests are still on the road, heading for Intervales & Canastra!! !|Which means: More good News will be coming soon! This month we will have our first Trip to the Pantanal ! What about the rain season? No problem!!! The Hyacinth Macaw and Jabiru & other 150 species of birds are resident and we shall see mostly of them!!! 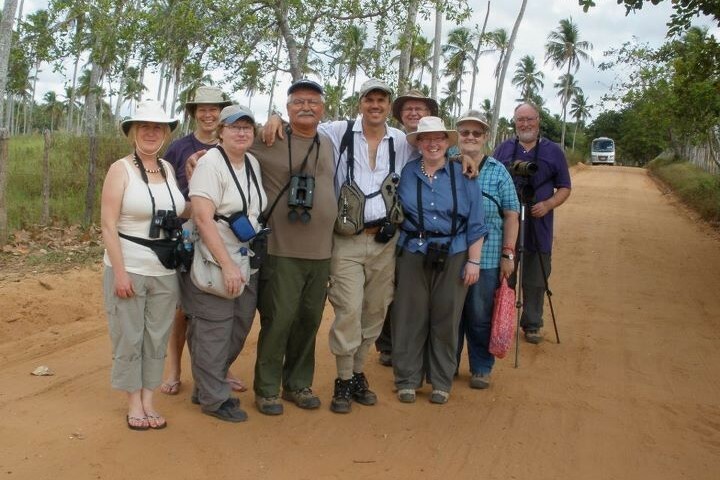 Paulo Boute & the Happy Tour Participants of the Brazilian Northeast, 2012 – Birding Trip. In March, we had some very successfull trips: Pantanal, Alta Floresta and Brazilian Northeast – Including VERACEL. The Pantanal tour gave us some interesting birds such a flock of eight Swallow-tailed Kite, the very rare Rufous-rumped Seedeater. The Pantanal tour had a extension to Serra das Araras, where both parents of the newly hatched chick of Harpy Eagle, where right by the nest. In Alta Floresta our guests had also great views of the Harpy Eagle on the nest located, there, as well. The Brazilian Northeast was very good too. Our guest ( on a private tour) had the very rare endemics he wanted to see. They covered Itacaré, Serra Bonita, Boa Nova and Veracel – The Cotinga Paradise! We are the only tour Company with a Resident Guide in Bahia, the Best Birding State for the whole Brazilian Northeast. We are very excited that we shall have many more tours to there! We had a very nice trip to the Pantanal. One guest from Washington D.C., that came to present a lecture in Sao Paulo and took the chance to visit the Pantanal, Serra das Araras and Chapada dos Guimaraes National Park. It was her first trip to Brazil. Making a long story, short: She got 160 Lifers!!! June, 2012: This month will be forever on Paulo’s memory. We had the pleasure and honour to guide David & Diane Reesor, from Vancouver, Canada. Two days, in a row, with Harpy Eagles at Serra das Araras, followed with the encounter of a pair of Crowned (Solitary) Eagles, with absolutely astonishing pictures of them ALL! In the total the Reesors, will be using the services of Boute Expeditions for the entire month of June(!!! ), visiting the following locations: Pantanal, Serra das Araras, Chapada dos Guimarães National Park, Itatiaia, Ubatuba, Iguassu Falls and Rio de Janeiro. Their web site is: http://www.reesorphotography.com/ Their Brazil’s pictures shall be there, sometime, during the month of July. So far, our best month for 2012! We had several Photo and Birdwatching Tours. All of them, with great success.One of our guests, even, asked to return one day earlier, since he didn’t want to see more Jaguars! Our expectations are even bigger for August, that shall be drier than July, bringing even more Jaguars along the banks of the Cuiaba River! More News soon! More than 30 (Thirty) Jaguars!…and Counting!!! And, since we have more tours booked for August and for September…We shall get more than 50 ones!!! By the way, there is still space left for our Jaguar & Bird Tour, in September!!! Here are some of the pictures here. We started September, with great memories of the month of August. We had a Crowned Eagle in Itatiaia and Razor-billed Curassow at Serra das Araras. We made History: Since it is its first record, EVER! Among the several tours we had and still are having during the month of September, we would like to mention the encounter with three jaguars at he same time at the Pantanal. For November, we will have more trips to the Pantanal and Emas National Park!!! We, strongly, recomend some of our videos, recently published at: http://www.youtube.com/user/bouteexpeditions. We had lots of Jaguars, some Tapirs and the Young Harpy Eagle has been posing for many “Photo Sessions” !!! Yes! We got the Jaguars at the Pantanal & a special bonus a Collared Anteater, as well! At the moment, we are running two trips, at the same time: Emas National Park and Brazilian Northeast, which starts at the city of Fortaleza, ending in Bahia. We are running three tours this month: Two at the Brazilian Northeast and one for the Atlantic Forest. So, far the first tour to the Atlantic Forest couldn’t be more rewarding: White-necked Kite in Sergipe, where it is much rare compared to the one in the Pernambuco State and smashing views on the rarest Brazilian Fire-eye: The Fringe-Backed one!